Infrared Thermal Imaging Scans, IR Aerial Roof Scans. Our FLIR equipment is not just state of the art. The technology is the same used on that of our military and on all attack aircraft. Ask us how we can literally see thru walls. We use Thermal Imaging to locate electrical hot-spots, missing insulation, water leaks, roof leaks, moisture intrusion, energy, heat loss, duct leakage, and the list gets larger. We have used infrared imaging at some of the largest and magnificent structures in the state including schools, hotels, hospitals, and offices. Thermal imaging inspections provide us with a picture of a specific condition of a building. Infrared cameras allow us the ability to see and locate what the naked eye is unable to detect. 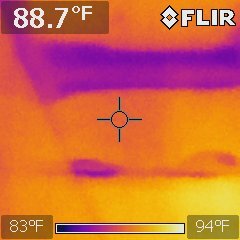 Infrared images can capture thermal anomalies from moisture or water damage, roof leaks, stucco, EIFS, chimney staining and window leakage. 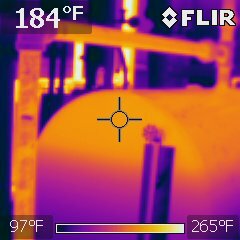 Infrared Scans are able to locate water and moisture intrusion in buildings by thermal patterns. A Building Envelope survey can locate missing or deficient insulation, water leakage or moisture, energy loss from windows and doors and flat roof surveys for water intrusion.